My morning started bright and early at 2:00 a.m. with a 65-mile drive to Oceanside. I arrived plenty early. I was happy to see a friend, Sheila, from the O.C. Tri Club parked next to me at 4:30 a.m. Nice to see a friendly face on a morning like this one. The transition area was pretty relaxed. The good thing: the number marking volunteers were under whelmed. The bad thing: port-a-potties have no lights. It was still dark. The great thing: Fe-lady racked her bike right in front of mine. Oh, and the girl next to me helped get my race cap on over my hothead cap after several funny, failed attempts to do it myself. We lined up in the corral for the swim around 6:30 a.m. The sky was just starting to turn shades of pink and gray from pitch black. The young man who sang the national anthem gave me chills – just when I didn’t need them. Then came the loud music. I started dancing to the Rolling Stones with Fe-lady to warm up and work off those jitters. It seemed so surreal that the race was finally about to begin. Coach Beth had really worked with me on floating starts three days earlier. 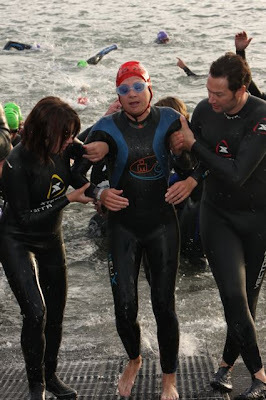 I was prepared to swim out to the starting line and bob around for a minute on my belly. Then I was told to hammer for a 100 yards. We practiced this half a dozen times in the Bay. Nope. There was something far more evil in the plan for me. Swells. I didn’t grow up surfing in California. On mornings like this one, I sometimes wish I did. My friends and coach assured me there would just be a little bit of chop at the turnaround and it would be mostly flat like the Bay. In this race, the buoys are strung out like a “J” – the turnaround at the top of the letter. As soon as I made it around the bend, the tossing around began. I stopped to see if it was a race boat. Nope. $#@%! It was beyond me how swells snuck into the harbor. They threw me off my rhythm. It created a double surge of adrenalin. I stopped several times to get my bearings and contemplate tackling the bigger sets. I was out of my element for at least a third of this race. 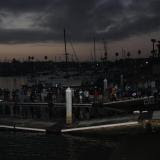 When I made it back into the protected depths of the harbor, I felt relief. I even experienced s Zen moment while matching a guy next to me stroke for stroke. He breathed to the left as I breathed to the right. I was staring at him for at least 70 strokes and it felt good. Sandy and Nikki were there cheering me on like crazy. I never heard them over the din. Sadly, I thought my oh-so-loyal friends overslept. They’re not morning people. Turns out on this morning, I was not only nearsighted, but deaf too. They screamed at me as I made my way through the transition. They said I had complete tunnel vision in there. As I ran tiptoed through the long transition area, I spotted the clock tick to 53 minutes. I was discouraged. I was shooting for 45 minutes. I tried to cheer myself up with the idea of making up the time on the bike. It wasn't until 7 miles into the bike that I really cheered myself up with the realization that the clock reflected the pros start time, not mine. I started six minutes behind them. I finished this leg in 47 – not too far off my goal, considering what I swell time I had out there. The worst part of my race was behind me. I was psyched.